Back pain causes thirteen million working days to be lost in Britain each year. The spine, being made up of twenty-four fragile bones and associated cartilage and tendons, supports the whole weight of the body and therefore it is understandable that it sometimes goes wrong. Because of the complex nature of the spine it is advisable to consult your doctor if back pain persists for more than a few days. If, as is usual, the pain has been caused by strain ie lifting too heavy weights etc. be sensible and take things easy. Take care to sit as upright as possible with a support for the small of the back or lie flat on a firm surface, whichever is more comfortable, take aspirin or paracetamol which will not only ease the pain but will help to relieve inflammation. Bed sores are far easier to prevent than cure. They are caused by prolonged pressure to certain parts of the body when lying in bed for long periods. They can be prevented by encouraging the patient to shift position as often as possible and taking care to smooth out creases in the bottom sheet which could lead to localised irritation. Keep your eye open for red marks appearing at the pressure points, such as heels, elbows, buttocks and hips and if they begin to appear, inform the doctor if they get worse. Apply large quantities of cold water to the affected area as soon as possible and maintain this until the pain subsides. This may take as long as fifteen minutes! 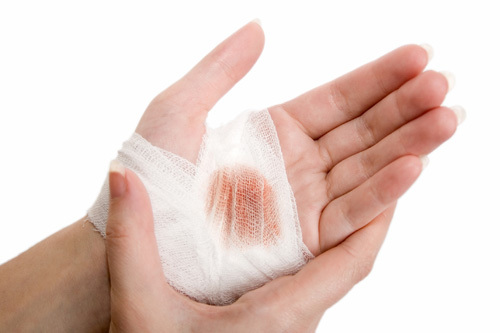 If the skin is unbroken but blistered, apply a loose, dry dressing. If the burn is larger than four or five inches in diameter or if the skin is broken, consult the Accident & Emergency Department at Hospital as soon as possible. Even in this day and age there is still no magic cure for the common cold. Go to bed, take plenty of drinks. If you have a headache or feel feverish, take aspirin or paracetamol. Do not bother to take antibiotics you may have in the house - these will have no effect. On the first day a rash appears as small red patches about 3-4mm across. Within a few hours of these developing, small blisters appear in the centre of the patches. During the next three or four days further patches will appear and the earlier ones will turn 'crusty' and fall off. Oily calamine lotion may be applied to soothe the often severe itching. Cool baths may also help. The most infectious period is from two to three days before the rash appears and up to five days after this date. Children may return to school as soon as the last 'crusts' have dropped off. The rash appears during the first day and usually covers the body, arms and legs in small pink patches about 2-4mm and doesn't itch. No other symptoms are usually present apart from occasional aching joints. It is infectious from two days before the rash appears until the rash disappears in about four or five days from that date. The only danger is to unborn babies and, therefore, it is important that all contacts are informed in order that anyone who may be pregnant can contact their doctor. The rash is blotchy and red and appears on the face and body around the fourth day of illness. It is at its most infectious from two to three days before the rash appears until eight or ten days after that date. Immunisations can help prevent this disease. Symptoms are swelling of the glands in front of either ear often followed, after a couple of days, by swelling in front of the other ear. It is infectious from two to three days before the swelling appears until eight or ten days after that date. If the pain is severe you should consult your doctor. Sit in a chair (leaning forward with your mouth kept open) and pinch just below the bone for approximately ten minutes, by which time the bleeding should have stopped. Avoid hot drinks for 24 hours. Do not blow your nose as this will restart the nose bleed. If symptoms persist, consult your doctor. Most attacks are not serious and are usually caused by indigestion or wind. A hot water bottle will often relieve the symptoms and in the case of indigestion a teaspoon of bicarbonate of soda in a glass of water will help. If the pain lasts for longer than eight hours or increases in intensity you should consult your doctor. Treat as for other burns with cold water to remove the heat. Calamine lotion will relieve the irritation whilst paracetamol will also help. Children are particularly susceptible to sunburn and great care should be taken to avoid over exposure to the harmful effects of the sunburn. These creatures, contrary to popular belief, prefer clean hair and are therefore not a sign of poor personal hygiene. Medical head lotion can be obtained from the dispensary without prescription, together with a special comb, which is the preferred method of control, advised by this practice.